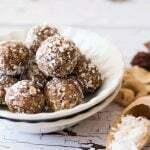 Cashew and Coconut Date Balls are a great little grab-n-go snack to have in the fridge. Combine raw cashews with sticky dates, throw in some brown rice puffs for a bit of crunch, some coconut for texture, and you have a satisfying little snack that comes together in a jiffy. Add all ingredients to a vitamix or other high powered blender. Blend on low until you get the desired consistency - I prefer mine to have some little chunks, but you may want a smoother result. Roll mixture into balls and roll in shredded coconut. Pop into an airtight container and into the fridge for about an hour until set. These are best if left in the fridge or freezer and just taken out when needed. Protein powder. For kids I use Coco Greens by Macrolife Naturals in this version, it is so chocolately I have never had anything but complements from the little ones. For adults I would use Vegan Macromeal Ultimate Superfood from Macrolife Naturals. Whole food bellies readers can get 20% off their order by using the code wholefoodbellies10. Although feel free to use whatever protein/superfood powder you have on hand.